It would make my life easier if I just wrote one kind of novel — some easily classifiable category. Many of mine fit my Small Towns, Big Ideas label, but some do not. This is one. Chicago isn’t a small town. Traveling brought me many times through the Chicago area, and I was fascinated by the Chicago River, which flows backwards. I’ve also loved the idea of sailing, and if I had been just a little wealthier, I would have bought the exact same sailboat that Tommy and his father Nick used to sail Lake Michigan. The story doesn’t start out science fiction. The oddness creeps into the story bit by bit as Tommy discovers the secrets that his father had hidden. Most of the story, in fact, centers on the sailing, where high school aged Tommy has to rescue his father’s friends and keep them out of sight of the Big Evil Corporation that is trying to keep those secrets from coming to light. Prior to writing this story, I had listened to the Furled Sails podcast, where there were many fascinating stories of the people who live their lives sailing the world’s seas. I would give a lot to join their number. Things don’t get seriously weird until the climax — but that would be telling. This was a fun book where I got to pull a lot of odd-ball ideas out of my hat and weave them together, adding texture to fill in the gaps that started the mystery. I have a loose outline for a follow-up book, if I can find the time to pull it all together. 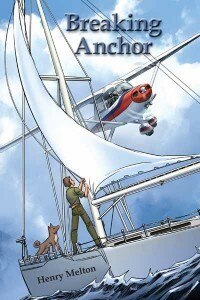 Breaking Anchor is hardly a cliff-hanger, but there are some issues that the sequel would resolve. One life-time doesn’t seem long enough to get everything done, does it? So, my love for sailing and the Great Lakes and Chicago, combined with a hatful of science fiction ideas make Breaking Anchor by favorite.